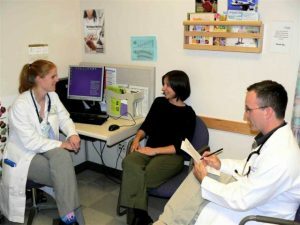 The Patient Centered Observation Form (PCOF) is a communication and relationship assessment tool to help health care team members communicate effectively with patients. Using the PCOF promotes self assessment and enables users to provide articulate, focused feedback to others. Users of this site are introduced to the PCOF through rating video interactions between health care team members and patients. A downloaded version of the PCOF is used for qualitative and quantitative evaluation. Once completed, the anonymous user transfers quantitative ratings to our website and then is able to compare their own evaluations with expert quantitative and qualitative evaluations of the same videos. We continue to study ways to maximize the educational value of the PCOF and of this site. Anonymous users of this site will be randomly assigned to one of two versions of PCOF training, both of which have been shown to be effective.